Last Farm Stand of the Season! Yesterday we harvested from all fields for the last farm stand of the year. 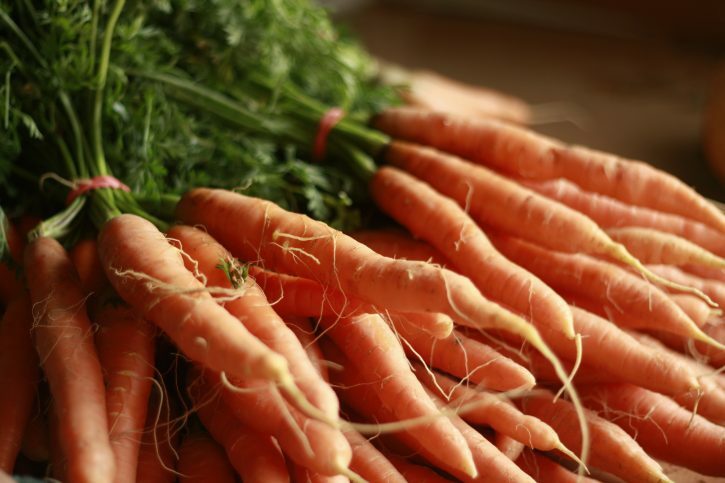 If you drop by Drumlin today you’ll be greeted by a colorful assortment of carrots, beets, radish, collards, kale and chard along with lettuce, cabbage, squash, potatoes and onions, and bags of spinach and arugula at the stand. Thanks to all who have shopped with us throughout the season. And thanks to the volunteers and staff who kept the stand up and running and conducted Know Your Food programs (complete with samples) all season long! 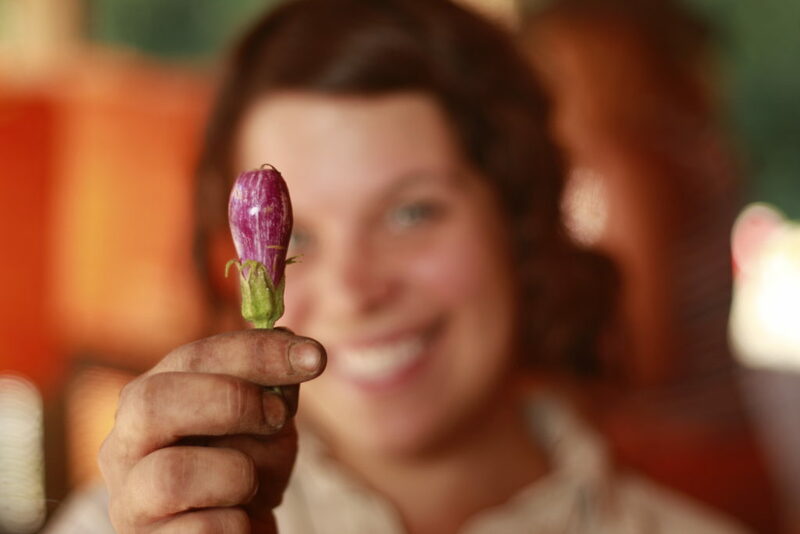 If you want access to fresh Drumlin veggies year-round, it’s not too late to sign up for the Fall CSA. The program runs throughout month of November with the first pickup today. Get in touch with Farmer Sarah Lang if you want to join. 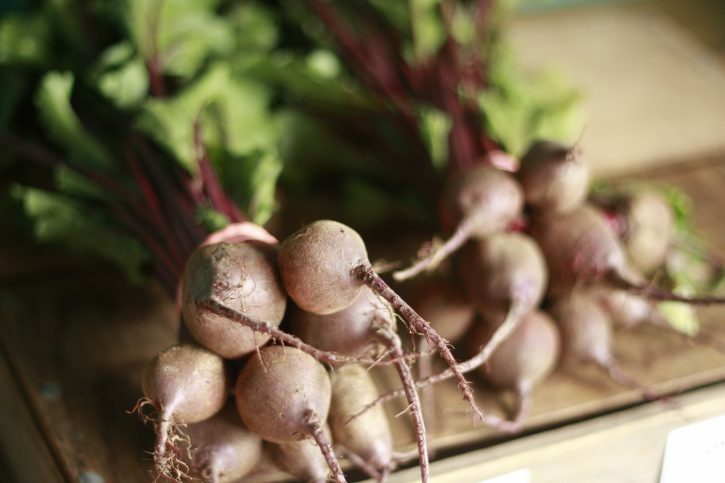 We still have three more Saturday markets to attend in Somerville, as well as a Winter CSA and regular deliveries to our restaurant and school partners through spring. That in mind, we’ve moved more than ten thousand pounds of potatoes into the root cellar and have just begun bringing in the carrots, parsnips, beets, turnips, celeriac, storage radish and rutabaga. This entry was posted in Farming, Uncategorized and tagged crops, csa, drumlin farm, farm, farming, harvest, vegetables, veggies on November 1, 2017 by Heather. This week we delivered baking potatoes to Somerville Schools for the first time—around 1,800 individual potatoes, or 720 pounds, to be exact! We chose the Désirée variety because of its prized flavor and interesting appearance: smooth, pink skin and yellow flesh. Josh and Andrew started digging the potatoes on Saturday with Drumlin’s 4-H program participants and two community volunteers. (We were so grateful the 4-H group chose to trek all the way to the outermost field to help us!) Working together, Josh and Sarah finished the job on Sunday afternoon before the rain arrived. 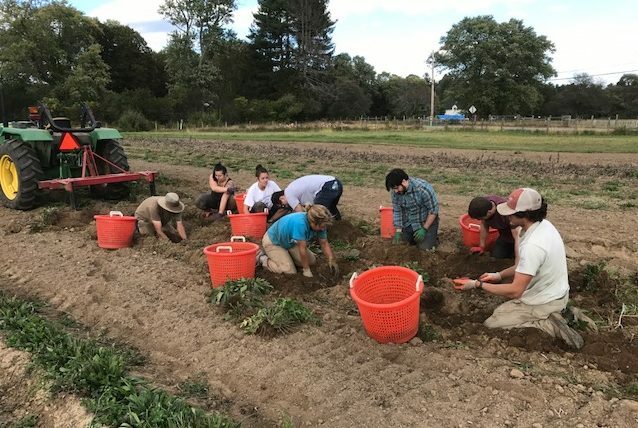 Late last week volunteers from Burlington’s 128 Technology and Wilmington’s Securadyne Systems helped us prepare for Saturday’s market in Union Square, harvesting sweet potatoes, baking potatoes, peppers, tomatoes, and eggplant. Demand for these veggies and our tomatoes remains high, even though ripening is happening more slowly now with the longer nights. It really helped to have many people combing over the plants to find the cherry tomatoes and miniature eggplants hiding under dense foliage. Thanks all who helped make this past weekend’s market a success! This entry was posted in Farming and tagged crops, drumlin farm, farmers market, farming, harvest, volunteers on October 12, 2017 by Heather. Looks like the first heat wave of the year has arrived. It’s 95 in the field where volunteers Anne and Shelia are crawling along over the hot soil thinning beets—amazing! The heat will push the strawberries and peas along, and we’ve moved Strawberry Day to June 24 because not enough of the berries will be ready by this weekend. We do plan to pick strawberries for the first time tomorrow morning and bring them up to the stand. This past week we got lots of great help from three large groups. On Thursday, volunteers from Google planted dahlias. Their company made a donation to help us purchase the plants from a nursery. After planting the dahlias, the volunteers thoroughly weeded four beds of celery and celeriac. Thanks for the help! On Friday morning, Zach and Emma brought the camp counselors to the field to learn about our crops program and to get trained for the upcoming “Weedouts”—the mornings when campers get dirty and pull weeds. Thanks counselors for making camp a rewarding first connection to Drumlin for so many kids and families, and thanks for pulling those weeds in the radicchio and peas! 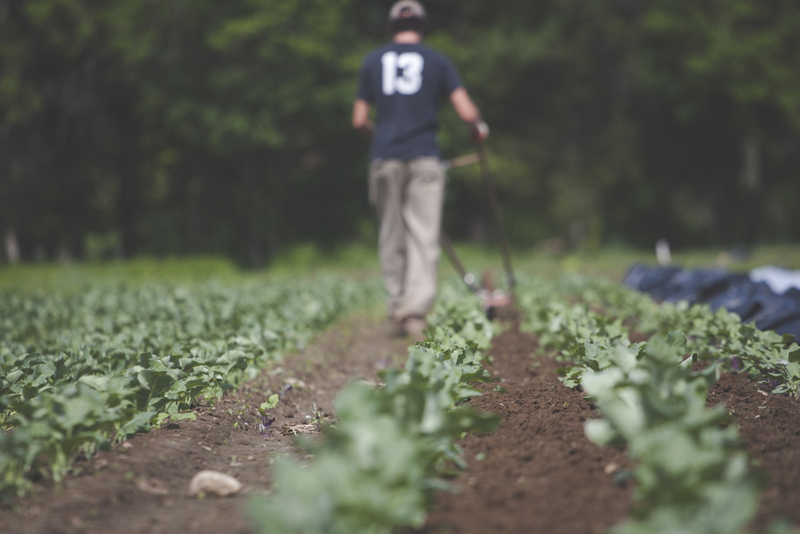 On Friday afternoon, Care.com brought volunteers to the field just in time to plant the sweet potato slips. A thunderstorm passed through, but the gang brushed it off and happily set 2,500 plants in about an hour. Thanks for all your great work and for the donation! 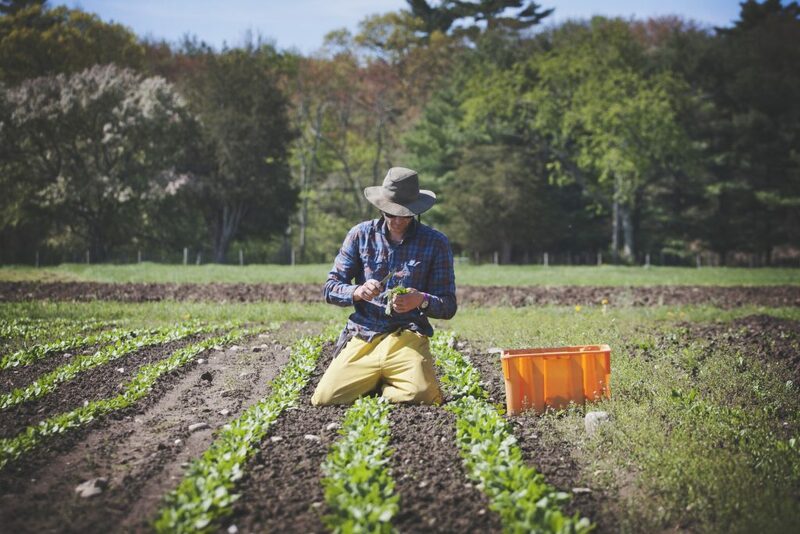 The summer CSA opens this week just as many new crops are about to come in. We are close to our first harvest of chard, beets, carrots and garlic scapes. We’re excited to see what’s ready come Wednesday morning. If you’re interested in grabbing a last-minute share, visit massaudubon.org/drumlincsa. This entry was posted in Education, Farming, News, Uncategorized and tagged crops, farm-to-table, farming, livestock, local, organic, sustainable, veggies on June 12, 2017 by Staff. Of late, several people have asked how many inches of rain we’ve been getting in all these storms. “Thankfully, enough,” I tell them. Enough for us to think about things other than putting out the rain gauge to measure our rising level of anxiety as precipitation dwindles! Let’s not do that again until we have to. And what did all our worrying during last year’s drought amount to? The crops that could thrive in the drought did so, while other crops suffered. 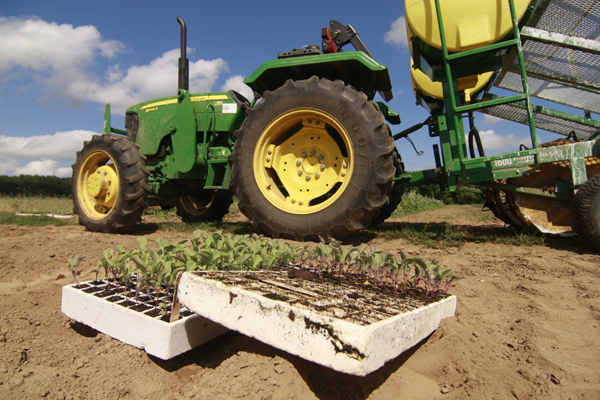 We had done our best by way of caring for the soil, fallowing fields and building soil organic matter, and we continue our commitment to this system. Thanks to the efforts of Livestock Manager Caroline and her assistant Alyssa, we’ve now introduced chickens into our fallowing plan so as to further improve the soil. You’ll see two mobile chicken tractors in the resting field near the entrance to Boyce. 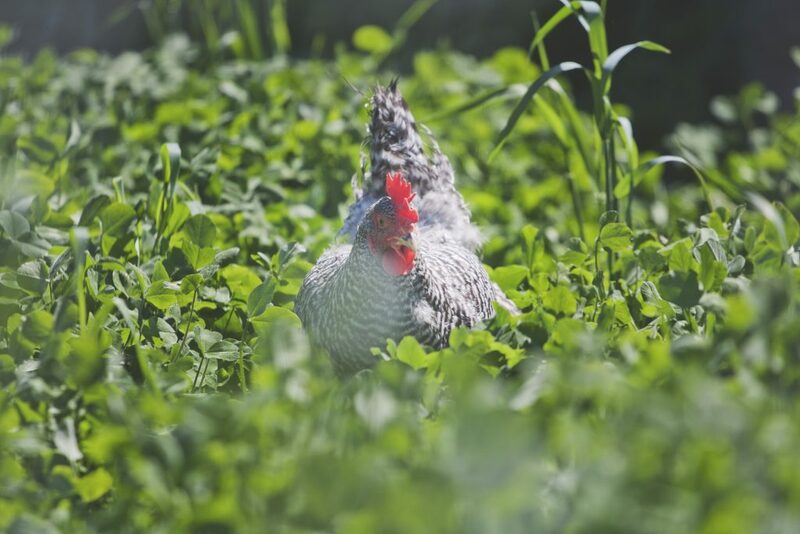 Our hens are eating insects and helping limit pest pressure while also processing the clover we planted there two seasons ago. Hopefully sheep will follow hens in the field and further enliven the soil. 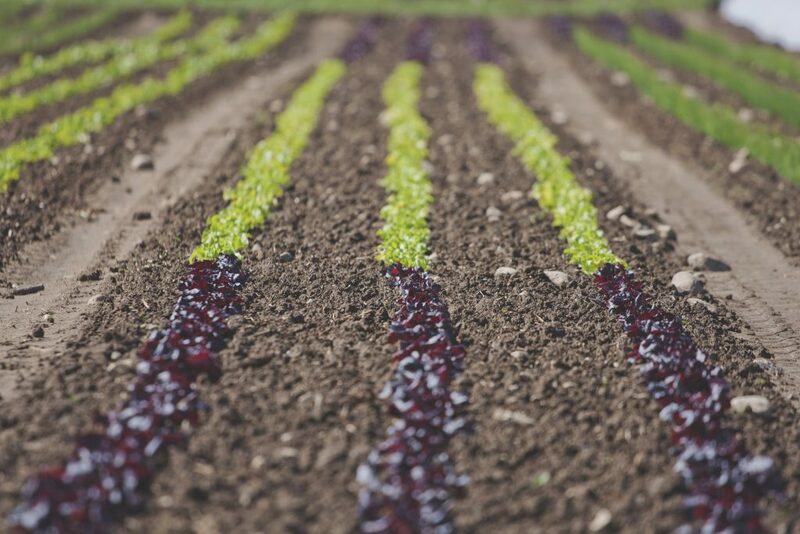 So while we’re not worrying about water, we are thinking a lot about how to get the greens to grow faster in this cool weather so as to supply chefs, the Union Square Farmers Market in Somerville and our new spring CSA program. Early lettuce and spinach are on the cusp of being ready for harvest, so this past Saturday, Josh, Will and I hand-weeded to make future harvests more efficient. While we were killing weeds on Saturday, Sarah, Laura, and Avril were killing it at market. Nice work market team! Last year, Sarah introduced the market loyalty program for Somerville patrons. It’s a version of CSA where a customer commits money up front in return for a discount on produce and flowers. Sarah also experimented with bringing lots of greenhouse-grown microgreens to that first market, and they were a big hit. In birding news, we’ve marked two killdeer nests that really good parent birds brought to our attention. In both cases, a parent aggressively marched toward the approaching tractor instead of just leaping up at the crucial final moment, as is more often the case. Two days after noting the nests, we saw six hatchlings scurrying around. We assume that must be the result of an additional two nests because we’ve never seen more than four eggs in one nest. But we have no idea where they came from. The parents are still sitting on the two nests they helped us identify. Perhaps by next week, the mystery will be solved. This entry was posted in Education, Farming and tagged crops, csa, farm, farm-to-table, farmers market, local on May 16, 2017 by Staff. It’s surprising that any plants are thriving under these hot and dry conditions. But the soil retains some moisture, and we’ve had a great melon and tomato season. We are reaching the end of our sweet corn harvest. We have white corn available at the stand today and perhaps for a few days more. We’re also beginning to harvest our last watermelon variety of the season—little baby flower. It’s red-fleshed and meant to be small or personal-sized. You can find a bunch at the farm stand. During last Friday’s quick shower of .15 inches, we sheltered in the greenhouse and seeded the next round of lettuce while waiting it out. Lettuce and bok choi are the only crops we’re still starting in the greenhouse at this point in the season. The greenhouse is now primarily a place of storage for winter squash, pumpkins and sweet potatoes. Feel free to step inside and take a look during your next visit. Mid-August through September is the busiest time at Union Square Farmers Market. People are back from vacation and eager to buy all the summer favorites. Each Saturday, we mount an intricate and large display under three tents, including a whole table devoted to cut flowers. Farmers Sarah, Jessica, Katie, Cara, and Erin have been doing a great job keeping up with long lines of customers on some scorching days on the pavement in the city. Thanks to you all and to the market volunteers for doing such a good job representing the farm and Mass Audubon! This entry was posted in Education, Farming and tagged crops, csa, drought, farmers market, farming, greenhouse, local, organic, veggies on August 30, 2016 by Staff.